When it comes to the telling American war history, Fayetterville, North Carolina has bragging rights. 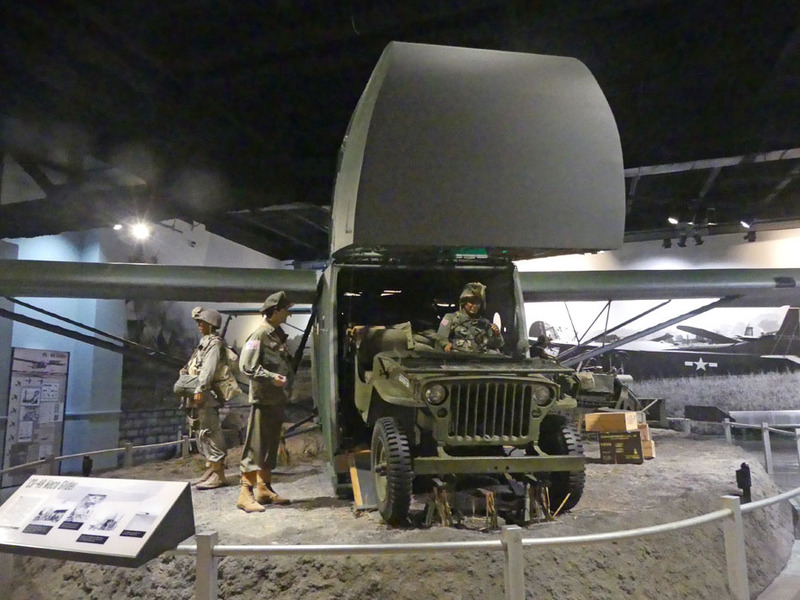 Fort Bragg's 82d Airborne Division War Memorial Museum commemorates the sacrifices made by the 82nd Airborne and Special Operation Troops in wars from WWII and ongoing today. There are even more veterans honored in the North Carolina Veterans Park. 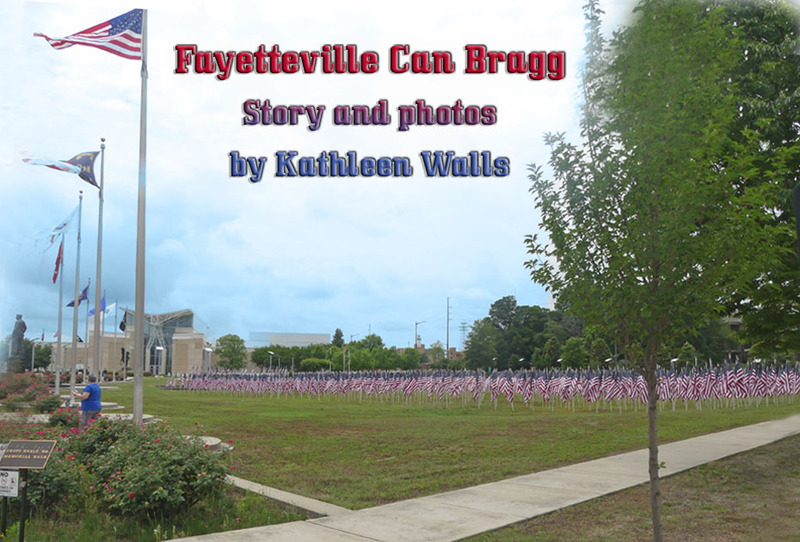 North Carolina Veterans Park shares a parking lot with the Fort Bragg Airborne Museum. The park is a combination of wandering paths, stunning exhibits, magnificent art, gardens and water features plus an outdoor amphitheater. 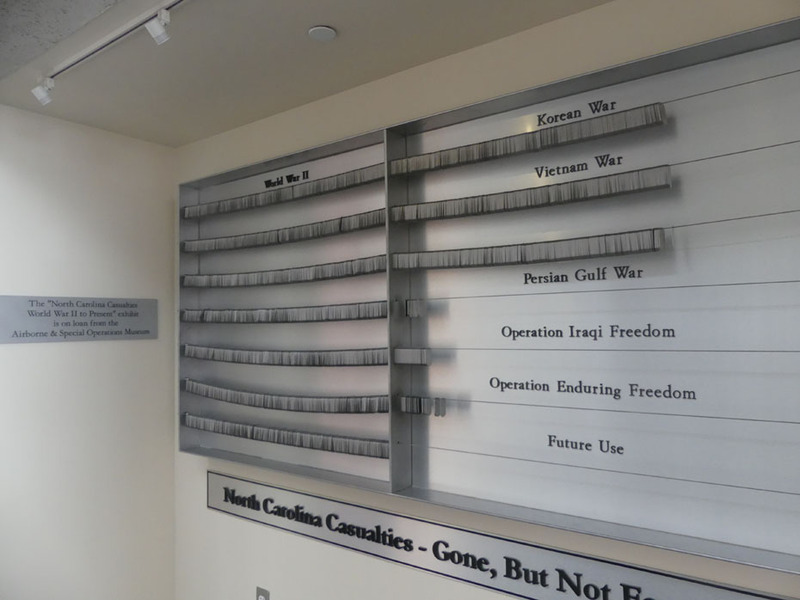 It recognizes all of North Carolina's veterans of every service and all of our wars. The North Carolina WWII to Present exhibit features dog tags imprinted with the military member’s name from each North Carolina hero that was killed in action from WWII to today. Not only are our human fighters for freedom honored but also their four legged helpers. 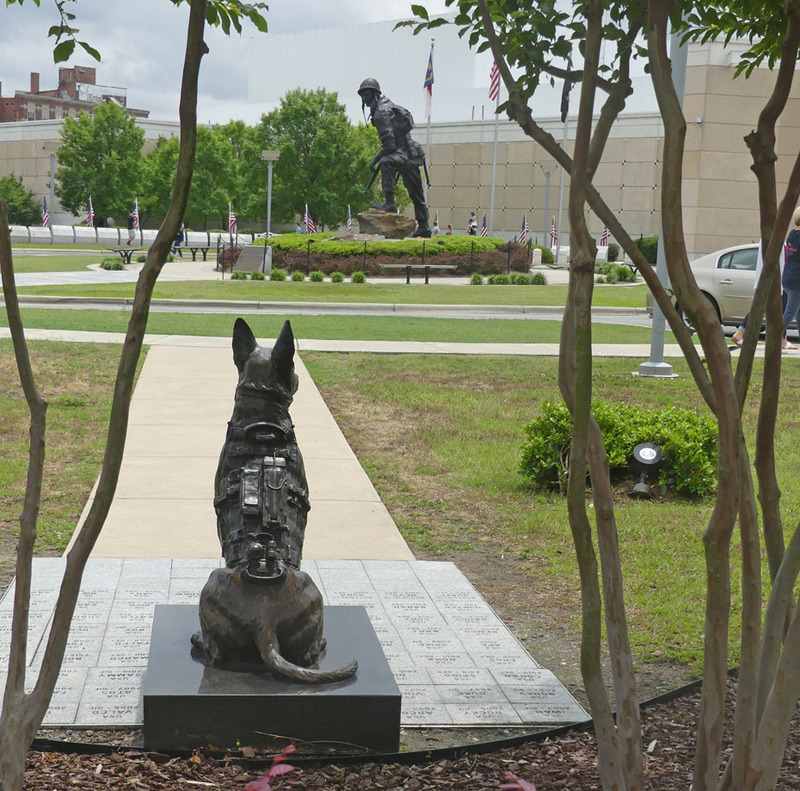 Constant Vigilance is the world’s first memorial to special operations K9s killed in action. The statue watches over Iron Mike near the entrance to the Airborne Museum. These canine soldiers saved many lives. 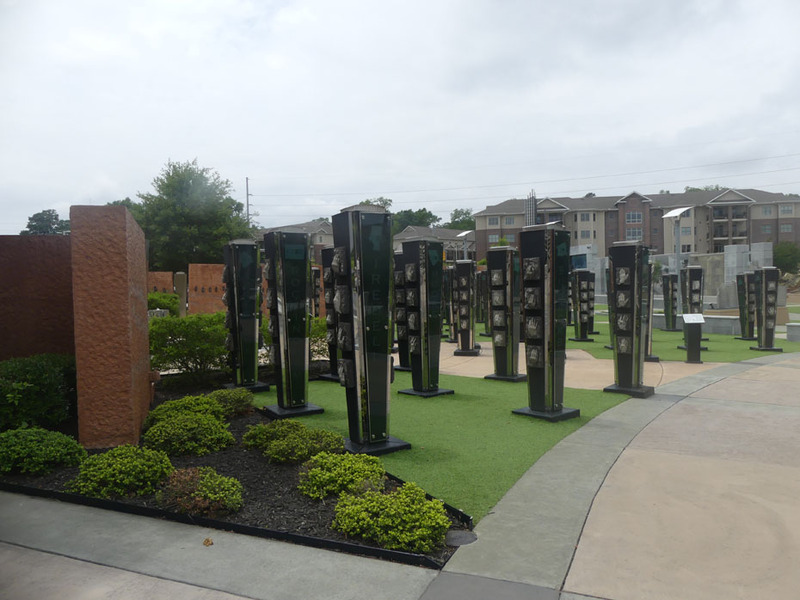 In the Community Plaza there are 50 black glass columns each engraved with the names of two North Carolina counties covered with cast iron hand prints of veterans from each county. One of the exhibits in the Visitors Center has an interesting story attached. 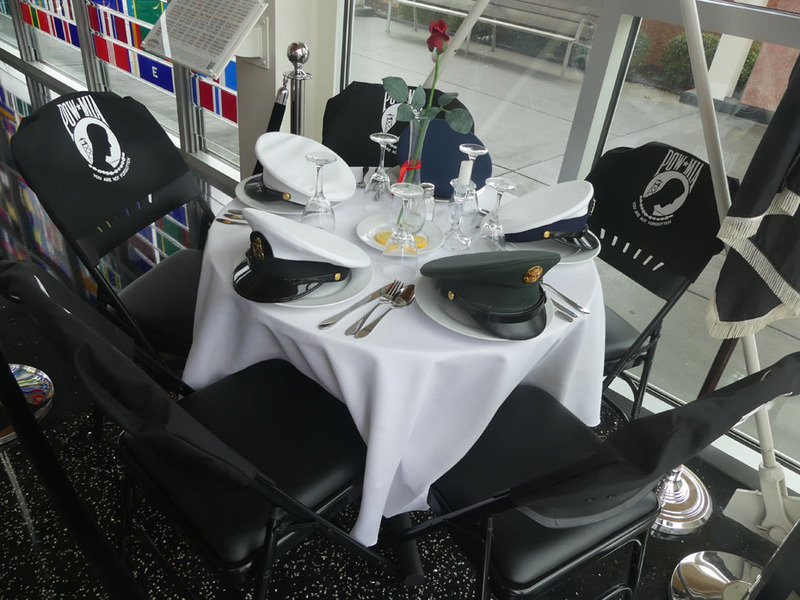 The Missing Man Table is a round table set for dinner with a hat representing each of the five branches of service who have men missing in action still resting on each plate. During Hurricane Matthew in 2016, the museum was flooded and many exhibits including the huge heavy counter in the Visitors Center were moved and damaged by the raging waters. The water level had risen above the table level. However, the Missing Man Table seemed untouched. It must have floated gently above the waters and settled back in place with all the setting and hats still in place. There is so much more to see here but let's move on to the museum. 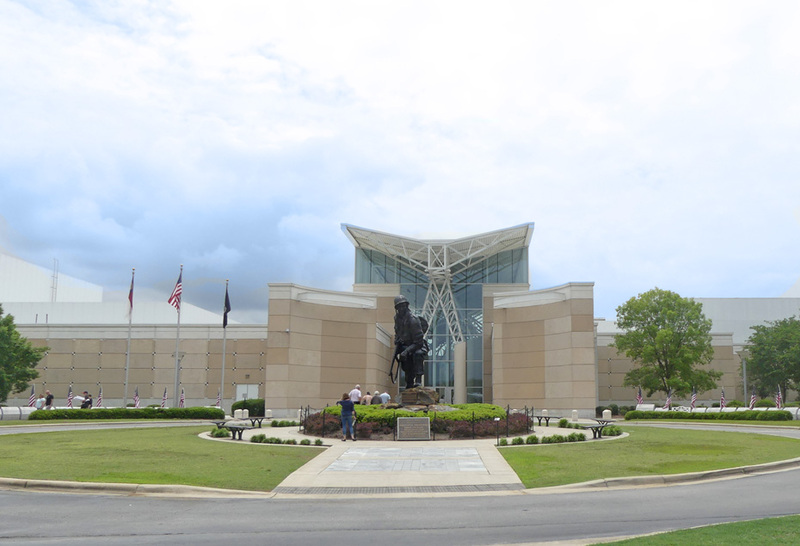 Iron Mike guards the entrance to the Airborne & Special Operations Museum. He is not any one soldier but represents all of the airborne troopers. He was built in 1965 and stands 16 feet tall on rocks from the first airborne training jumps. 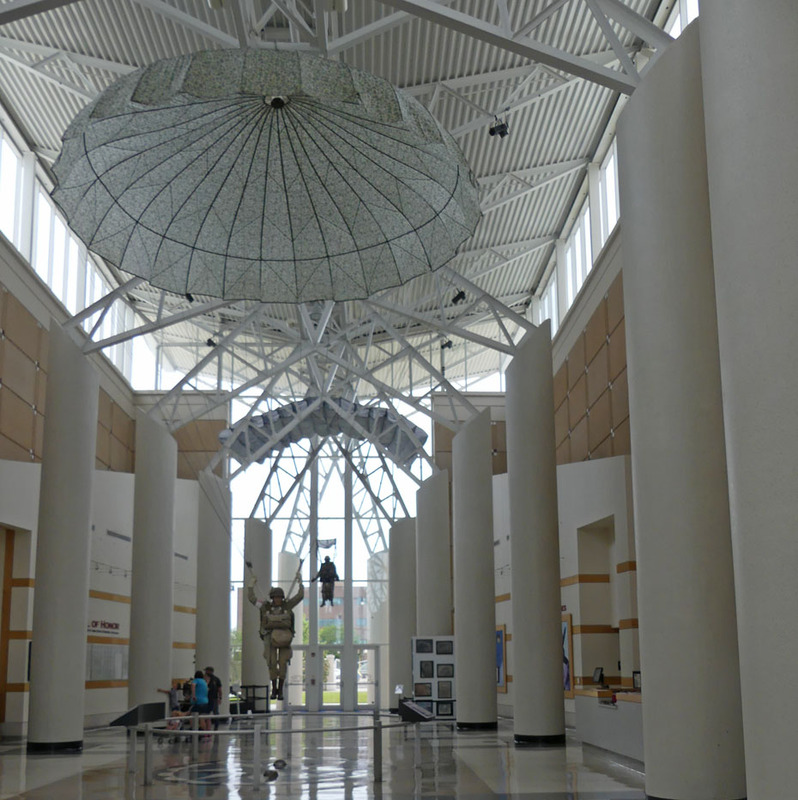 The first thing you see on entering the museum is an airborne trooper parachuting in for a landing. 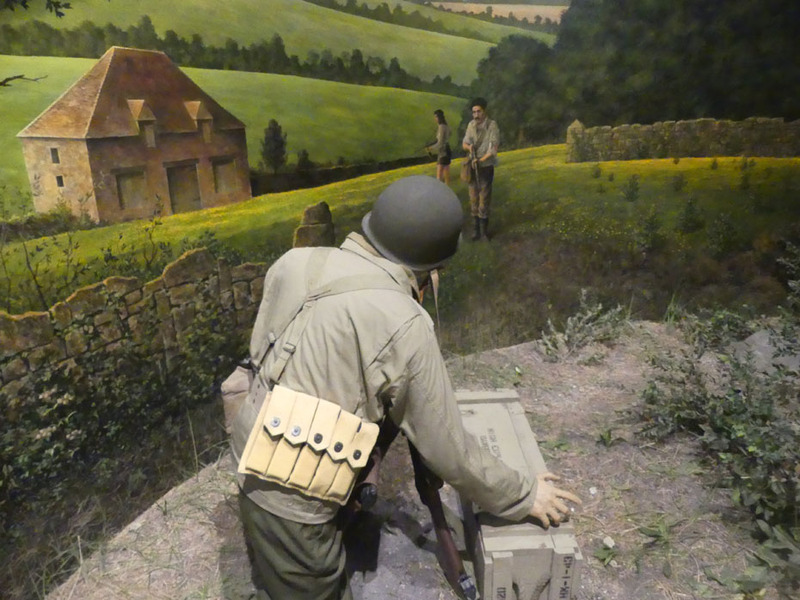 The military equipment in the exhibits is real and the models are so lifelike you want to speak to them. 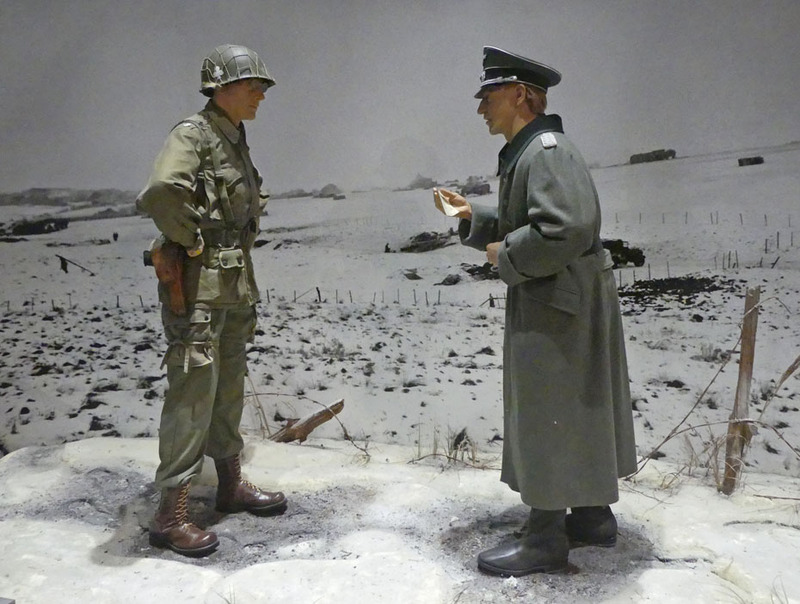 One exhibit shows a trooper in Jedburgh Operations meeting resistance fighters in France. Jedburgh Operations landed men in France right under German troops' noses to aid the resistance. They were so effective that Hitler issued an order in October 1942, “All enemies on commando missions—in or out of uniform, with or without weapons, in battle or in flight—are to be slaughtered to the last man." In December 1944 during the battle of the Bulge, American soldiers, members of F Company of the 327th Glider Infantry Regiment 101st Airborne Division, had captured the town of Bastogne, Belgium. They were surrounded by German troops. The German commander sent an officer under a flag of truce with a note demanding the Americans surrender the town. The American commander, Brig. Gen. Anthony C. McAuliffe, upon seeing the note exclaimed "Aw, Nuts." While trying to decide on a reply to the surrender request, McAulliffe was debating what to say. One of his staff suggested his earlier comment was hard to beat. MCAulliffe then wrote "To the German Commander, N U T S ! The American Commander"
The exhibit shows Colonel Harper, who delivered the note back to the German, and the German officer with the note in his hand. Both men are standing in the snow as the German tries to understand the note. Harper explains, "If you don't know what 'nuts' means, in plain English, it's 'Go to Hell'." Southeast Asia has long been a flash point. Korea and Vietnam have exhibits. It wasn;t alwsya guns and weapons. One exhibit called Courage and Compassion show "The Cowboys" in a Huey Helicopter performing medical services to a fallen comrade. The Cowboys were active in Vietnam from 1966 to 1971. 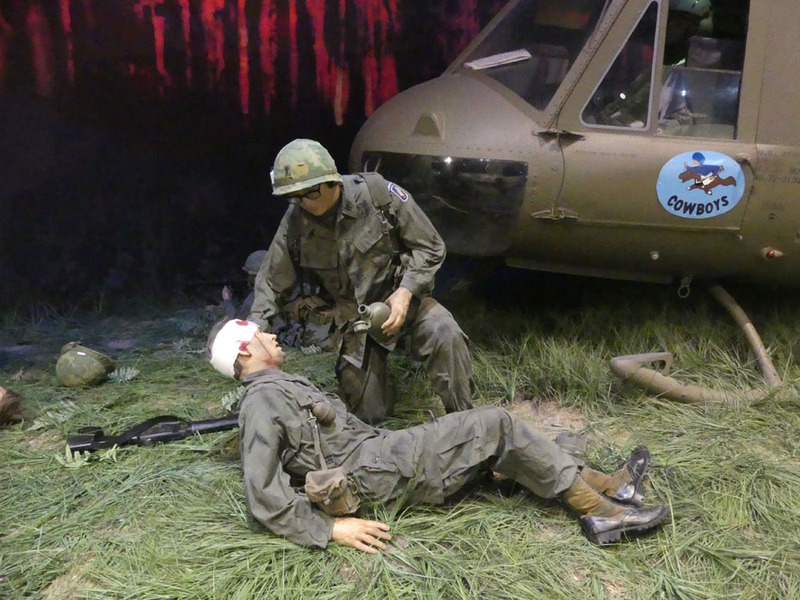 Angels in Red Hats exhibits memorializes the MACV Unit, members of the Airborne Advisory Team 162, first advised, and then helped train and fought alongside an elite Vietnamese unit from 1955 to 1973. 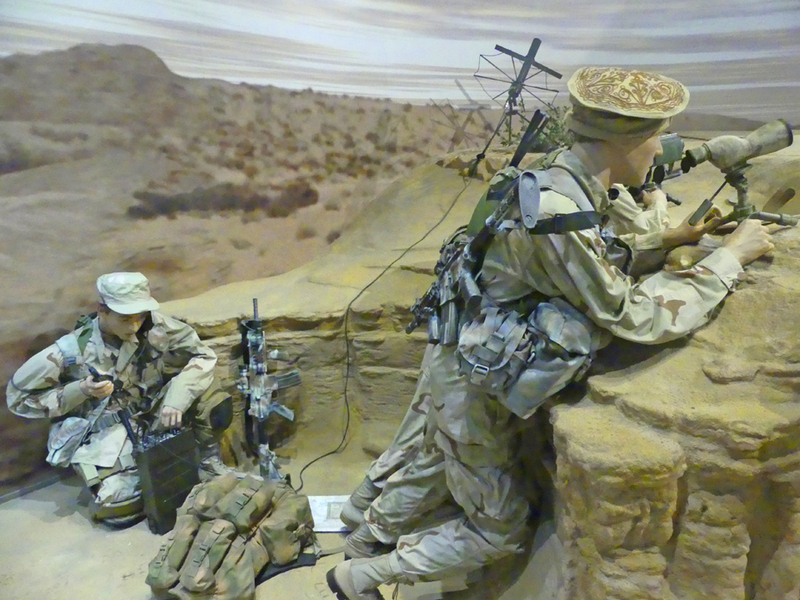 Moving into present day, combat in Afghanistan and Iraq are presented in such realistic exhibits, you feel like you are there. There are so many exhibits here you could spend all day. I'd be writing a book if I tried to cover them all. This is a wonderful place for a child to learn America's wartime history. Best of all, the museum is free. The FTC has a law requiring web sites to let their readers know if any of the stories are "sponsored" or compensated. We also are to let readers know if any of our links are ads. Most are not. They are just a way to direct you to more information about the article where the link is placed. We also have several ads on our pages. They are clearly marked as ads. I think readers are smart enough to know an ad when they see one but to obey the letter of the law, I am putting this statement here to make sure everyone understands. American Roads and Global Highways may contain affiliate links or ads. Further, as their bios show, most of the feature writers are professional travel writers. As such we are frequently invited on press trips, also called fam trips. On these trips most of our lodging, dining, admissions fees and often plane fare are covered by the city or firm hosting the trip. It is an opportunity to visit places we might not otherwise be able to visit. However, no one tells us what to write about those places. All opinions are 100% those of the author of that feature column. .